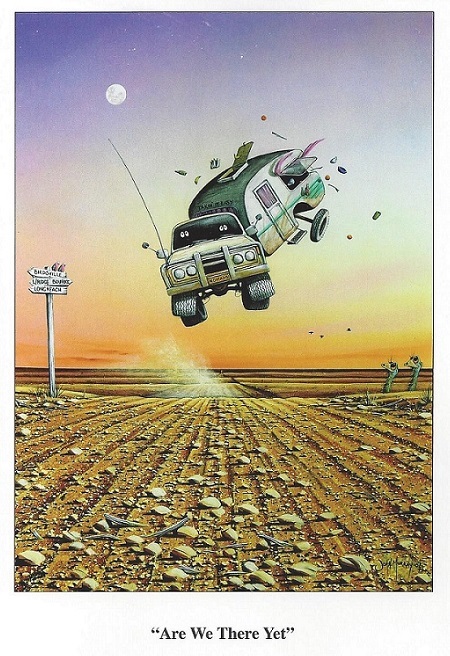 That’s not how it happened – there are no caravans crossing the Simpson Desert – but it’s how it felt! The image is a scan of a card I bought in the Birdsville Bakery. I almost bought this one too by John Murray. Got back on Wednesday, but it took me 27 hours to log on. Still sorting myself out. Working out how to pay for the holiday, dealing with 571 emails and about 1500 photos we took on the trip. About 7000 km at a leisurely pace over 26 days. 100 km was a good day in the desert! Wednesday night Mark was in town and filled us in on happenings in the world. We did hear about Hockey’s foot in mouth in the middle of the desert but not much else. As Mark said, it wasn’t the worst thing that happened in the world, unfortunately. Hope to be back posting properly next week!